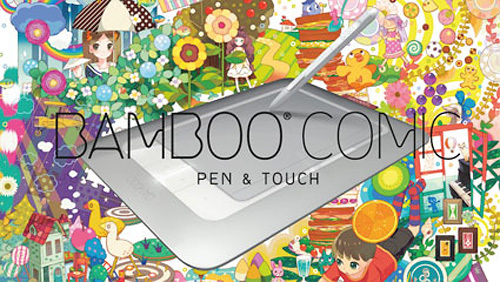 Bamboo Pen & Touch Comic Edition Aimed At Japanese Manga Artists | OhGizmo! There’s no indication it will be made available in North America, but as November 16, Japanese manga artists have been able to buy a special version of Wacom’s Bamboo Pen & Touch tablet (reviewed here) called the ‘Comic Pen & Touch’ that includes comic book specific software such as “the pixia painting program, the CG illust 4.5 paint program demo from manga supply maker Deleter, the Comic Studio Mini manga layout program, and the Comicworks manga creation program demo for new artists.” And given a lot of the software appears to be demo or starter versions, I can’t imagine the Bamboo Comic will cost any more than the standard Bamboo Pen & Touch version. Unfortunately the US market is not as tech driven as the Japanese market is. They have access to tons of stuff that we've never even seen before. One of the biggest problems in this country is Interweb speed. Most other modern countries have networks that make ours look like it's going in slow motion. The US average is right around 7Mbps while countries like South Korea connect at an average 22Mbps. And remember, we are just speaking of average speed here. Japan comes in at 16Mbps. I happen to get 16 myself but it's the fastest broadband home connection offered without paying a premium. Guess what? Even Russia has a faster average than us and they were almost a third world country during their transition to Democracy not long ago. I hope we get an offer similar to Japan. I love my current tablet, but a thinner and more portable one would be nice. The package sounds amazing too.